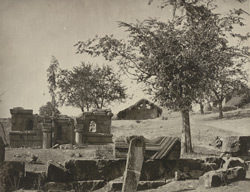 Photograph of the partly buried temple ruins at Vichar Nag near Srinagar in Jammu and Kashmir, taken by John Burke in 1868. This image is reproduced in Henry Hardy Cole's Archaeological Survey of India report, 'Illustrations of Ancient Buildings in Kashmir,' (1869), in which he wrote, 'At some distance from Srinagar, and on the road to Gauderbal [Gandarbal], there is a Mahomedan Zearut [Ziarat] or Burial Ground, which has been built of parts of ruined Hindu Temples. The most perfect portion of the buildings is shown in photograph 43-'68.' Vichar Nag is the site of a holy spring (springs in Kashmir are called 'nags' linking them as abodes of the mythical serpent-forms or nagas who were the original inhabitants of Kashmir when it was a vast lake). Kashmir is dotted with the ruins of many temples from its pre-Islamic past, many of which were sacked in the early 15th century or abandoned. Some of the remnants were utilised in the buildings of its Islamic rulers.